I used to love doing puzzles as a child, and I'm eager to introduce the twins to the joy of puzzles. When you finish a puzzle, whether 10 pieces or 1000, there's a feeling of success and pride that you can't get from other toys. For a child, that can really help their self-esteem along with just being fun. Mudpuppy has puzzles for all ages, including ones I'll be able to give to the twins once I know they won't try to eat the pieces. Mudpuppy was nice enough to send us their Day/Night Puzzle, which won the 2003 Parent's Choice Approved Award and the 2003 Creative Child Magazine - Seal of Excellence Award. It was also named one of Dr. Toy's 100 Best Children's Products in 2003. 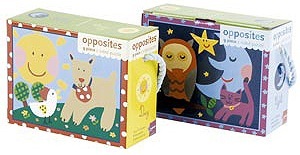 Mudpuppy's Day/Night Opposites Puzzle is one of Mudpuppy's collection of Two-Sided Puzzles. It has 9 beautifully decorated pieces, combined with a bold border, to help children see which piece belongs on which side of the puzzle. With this puzzle, you can teach children about opposites and concepts of time, such as the length of a day and a night. This puzzles also helps to build pre-reading and fine motor skills. I really liked how thick the pieces are, so once the pieces are put together they won't fall apart easily. When puzzle pieces come out of place, it can be very discouraging and aggravating for a child, so having them stay put is so important. The pictures on each side of the puzzle are colorful and engaging. I also love how the puzzle is two sided, so it's really like having two puzzles to put together. The puzzle pieces themselves are nice a large, so small fingers can easily manipulate them. I am all for going green, and this puzzle contains 90% recycled paper and is printed with non-toxic, soy-based inks. The outer packaging also contains 70% recycled paper. I feel really good about giving this puzzle to my kids to play with because of how it's made. Cost: You can buy Mudpuppy's Day/Night Opposites Puzzle for $10 + $6.50 shipping ($$$$$). Overall: We give Mudpuppy's Day/Night Opposites Puzzle a 9.5/10! One very lucky reader will win a Mudpuppy Day/Night Opposites Puzzle! And if you don't win, or even if you do, you can take a 15% discount on any order from Mudpuppy by entering coupon code "zzz2" at checkout. First, visit the Mudpuppy website. Then, comment here and tell me about another of their products you'd love to own. 2) Follow @galisonmudpuppy on Twitter and comment here with your Twitter screenname. 5) Become a fan of Mudpuppy on Facebook, and be sure to let them know that The Twinners sent you! This giveaway will close on October 27, 2010 at midnight. We were sent a Mudpuppy Day/Night Puzzle free of charge for the sole purpose of this review; no other compensation was received. All opinions expressed are my own. would love to try Under the Sea Sticker Set Play Scene also! Muahaha! I'd love to own the Eric Carle The Very Hungry Caterpillar Wall Clock! I'm a follower through Google Friend Connect! I voted for you on Baby Boutique. I voted for you on I am a top mommy blogger. I would also love to have the Mighty Dinosaurs! 63 Piece Puzzle for my huge dino fan! Following Elana's Musings through GFC! I love the Sweet Owls Wall Clock. I'm a facebook fan of Galison/Mudpuppy under username Jennie Tilson. Left comment. I follow Elana's Musings through Google Friend Connect. I'd also love to own the Eric Carle The Very Hungry Caterpillar Wall Clock! Like The Twinners Reviews & Giveaways on Facebook. I entered the books giveaway. I would love to have the Princess Sticker Book. I want to keep my self fit. I hope your website will be helpful for me in this object. Your close cooperation will remain forever, I shall be very thankful to you. I would like to own the Painter's Palette Constructibles Building Set. I follow @galisonmudpuppy on Twitter. I am a fan of Mudpuppy on FB. I am a fan of your on FB. I also entered the Sweet Moments Giveaway. I also entered the Tommee Tippee giveaway. I also entered the Soap Soundz giveaway. I like the Garden Money Bank. Another product I'd love to own is the Eric Carle The Very Books Block Puzzle! Visited Mudpuppy's site...my young son LOVES puzzles, so I'd get the 42-piece The Hungry Caterpillar puzzle for him! Voted for you on Top 100 Mommy blogs!